In the town of Koenigsberg there was a river with two islands and seven bridges. For a more accurate picture see the Koenigsberg Images page. Each Sunday people would go for a walk. After a while someone noticed that no matter where they started they were never able to cross each bridge once and only once during their walk. It seemed that no matter where they started and where they walked, they would always end up in the wrong place for crossing that last bridge. It was suggested that perhaps it was impossible, but there was always the nagging doubt that perhaps it was possible and people simply hadn't (yet!) found how to do it. 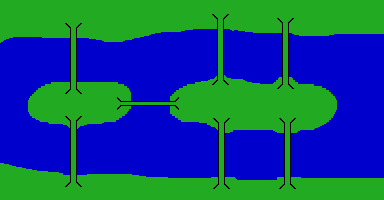 Because walking around on land or islands was irrelevant, he shrunk each of them to a single point, leaving only the lines representing the bridges. Now observe that if you can draw this diagram without lifting your pen and without going over any line twice, that gives you your Sunday walk. There are four meeting places, here labelled A, B, C and D, and all of them will have to be visited on our walk. You might start at one and finish at another, but there will always be at least two of them that are neither start nor finish. Let's pick one to think about, we'll call it X. Since X has some bridges coming to it we will have to visit it at least once. Since we neither start nor finish there, every time we come in we must go out again, and on a different bridge. That means that the total number of bridges that land at X must be even. For every in there is an out, and if there's an odd number of bridges, that won't work. So X, our place that is neither start nor finish, must have an even number of bridges. However, all our landing places have odd numbers of bridges,and that makes it impossible to do our walk. No diagram can be drawn if it has more than two places with an odd number of lines. If a diagram does have two places with an odd number of lines, then one of them must be the start and the other must be the end. This is an example of necessary versus sufficient. We have shown that it is necessary that at most two places have an odd number of entry/exit points, but we still need to show that the condition is sufficient. In fact the condition is not sufficient. Can you find an example? 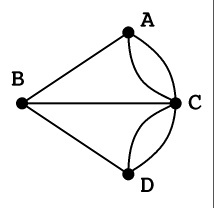 Instead of asking to cross every bridge, can we find a simple rule to decide whether it's possible to visit every point exactly once? No-one knows - this is an unsolved problem. In fact, it's one of the Millennium Problems. If you can solve it, you can win a million dollars! This is one of the topics that can be given as a mathematics talk.